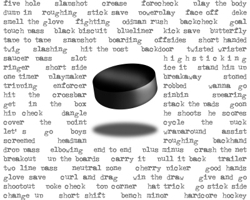 Below is a partial list of common terms found around the rink. If you come across terms not listed and want to know what they mean please email us and we’ll do our best to find out. If you have some terms that aren’t listed please let us know that too. Click here for a great reference site for hockey terms. 500 (also known as .500) is an even percentage, usually referring to a team's overall record when their number of wins equals their number of regulation losses. 5-on-3 - Where one team is playing at full strength (5) and the opposing team is 2 players shorthanded (3). 5-on-5 - Where both teams are playing with 5 skaters each. Attack zone - The opposing team's end of the ice, as determined by the blue line. Backhand shot - A shot that is taken from the backside of the blade. Backchecking - Rushing back to the defensive zone in response to an opposing team's attack. Biscuit in the basket - Scoring a goal. Blue line - The lines separating the attack/defense zones from the neutral zone. Boarding - Checking a player from behind into the boards. Body checking - Using the hip (also known as hip checking) or body to knock an opponent against the boards or to the ice. Breakaway - When a player has possession of the puck and there are no defenders other than the goalie between him and the opposing goal. Butterfly - A style of goaltending wherein the goalie tends to cover the lower half of the net with his or her leg pads. Center - A forward position whose primary zone of play is the middle of the ice. Change on the fly - Substituting players while the puck is in play. Cherry picking - When a player stays near their opponent's zone waiting for an outlet pass in order to receive a breakaway. Coast to coast - A solo scoring chance originating in the player's own defensive zone. Crease - The blue ice in front of each net. Cross-checking - The act of checking an opponent with the shaft of the stick held in both hands. This is illegal and earns a minor or major penalty depending on the severity of the infraction. Coincidental penalties - When both teams are assessed an equal amount of penalties at the same time, usually on the same play or incident. Defensive zone - The defending team's zone as determined by the blue line. Deke - When a player handles the puck or himself in such a manner to fool the opponent into moving out of position, allowing the player to get past. Originated from the word decoy. Delayed offside - If a player enters the attack zone ahead of the puck but does not touch it, the play is offsides but no whistle is blown immediately, thus creating a delayed offside. Delayed penalty - When a penalty is called, the referee will raise his or her arm to indicate that one is being called, but if the team who committed the infraction is not in control of the puck, no whistle will occur until a player from that team touches the puck. This is called a delayed penalty. Dive - A dive is when a player embellishes contact made against him in order to draw a penalty, however, sometimes this ends up in a penalty being called against the diving player. Drop pass - When a player passes the puck directly behind him to a teammate. If executed properly, the puck stops moving and the pass's receiver catches up to it. Empty net goal - A goal scored when the opposing goalie is not on the ice. Enforcer - A player quick to fight who defends his teammates against violent members of the other team. Extra Attacker - A player who has been substituted for the team's goaltender on the ice. Faceoff - A faceoff is the method used to begin play. The two teams line up in opposition to each other, and the opposing centres attempt to gain control of the puck after it is dropped between their sticks by an official. Face wash - A face wash is when a player rubs his hockey glove over the face of an opponent. Fan - A fan is when a player misses the puck when attempting to play or shoot it. Five on three - Five on three (also called two-man advantage) is when one team has had two players sent to the penalty box. This leaves the opponent with five skaters (i.e., not including the goaltender) to penalized team's three. The team with the advantage has a very good chance of scoring during these periods. Five on five - See Full strength. Five-hole - A five hole is the gap between a goaltender's legs. Forechecking - Checking in the offensive zone in order to gain control of the puck and set up a scoring opportunity. Full strength - Full strength (also called 5-on-5) refers to when both teams have five skaters and one goaltender on the ice. Garbage goal - A goal that takes little talent to score. Most such goals are scored from right in front of the net, often when the goaltender is out of position. Goal - A goal provides a team with one point. A goal is scored when a puck completely crosses the goal line within the goal frame. Goal line - The line that the puck must completely cross in order to be considered a goal. Gordie Howe hat trick - A Gordie Howe hat trick is when one player scores a goal, notches an assist and gets into a fight all in the same game (a natural Gordie Howe hat trick occurs when a player does all three in one period, however many players see this as "showoffy" and it can be frowned apon in some hockey circles). Hand pass - The act of passing the puck using one's hand (illegal). Hash marks - The straight lines from the faceoff circles in front of both nets. Used to line up faceoffs. Hat-trick - A hat-trick is when one player scores three goals in one game. High stick - The act of hitting a player in the head or shoulders with a stick. Also the act of hitting the puck in the air above the height of the top goal pipe (4'). Hip checking - Using the hip to knock an opponent against the boards or to the ice. Hooking - Using a stick to hold or slow down a player (illegal). Howitzer - A very fast slap shot. Icing - Icing occurs when a player shoots the puck across both the red line and the opposing team's goal line without the puck going into the net or being touched by a player in the zone. If an offensive player touches the puck first after it crosses both the red line and the goal line, icing is negated. When icing occurs, a linesman stops play. Play is resumed with a faceoff in the defending zone of the team that committed the infraction. Jock - A jock (or for females, a jill) are simple devices used to protect the genitalia of an ice hockey player. J Shot - A snap shot that is started in the form of the letter J.
Laser - A hard, accurate shot. Laying on the lumber - See Slashing. Left wing - See Winger. Left Wing Lock - The left wing lock is a defensive ice hockey strategy similar to the neutral zone trap. In the most basic form, once puck possession changes, the left wing moves back in line with the defensemen. Each defender (including the left winger) play a zone defense and are responsible for a third of the ice each. Since there are normally only two defensemen, this tactic helps to avoid odd man rushes. Light the lamp - Scoring a goal. Line brawl - A series of fights involving most, or all, players on the ice at the same time. Man Advantage - When one team is penalized, and one of its players sent to the penalty box, the second team maintains a man advantage for the duration of the penalty (Major penalty) or until a goal is scored (Minor penalty). If two penalties are called on one team there will be a two man advantage. If more than two penalties are called on one team the man advantage is limited to two men. Man On - A warning from teammates to a player that an opposing player (that he may be unaware of) is near him. Usually given in loose puck situations. Meat Wagon - If a players only skill is fighting/hitting, they are a meat wagon. Natural hat-trick - A natural hat-trick is when one player scores three goals in a row without any player from either team scoring in between them, also when three goals are skored by one player in one period. Neutral zone trap - The neutral zone trap is a defensive ice hockey strategy used by a team to prevent an opposing team from proceeding through the neutral zone (the area between both blue lines) by forcing turnovers in that area. Odd man rush - When a team enters the attacking zone and outnumbers the opposing players in the zone. Offensive zone - See Attack zone. One timer - The act of shooting the puck directly off a pass without playing the puck in any way. Paddle - The wide portion above the blade of a goalie's stick. Penalty box - The penalty box (sometimes called the sin bin or bin) is the area where a player sits to serve the time of a given penalty, for an offense not severe enough to merit outright expulsion from the contest. Playmaker - A fast player who usually scores more assists than goals. A Playmaker has the speed and balance to make plays, and frequently relies on a sniper to finish them. Playoff beard - A playoff beard is the superstitious practice of a National Hockey League (NHL) player not shaving his beard during the Stanley Cup playoffs. The point - A player in the opponent's end zone at the junction of the blue line with the boards is said to be at the point. Poke checking - Using the stick to poke the puck away from an opponent. Power forward - A power forward is a large, muscular offensive player (6'0 - 6'5, 210-240 pounds), with the mobility to track a puck to the corners of the rink, the physical toughness required to dig it out, and the puckhandling skills to get it back to anyone in front of the net. Powerplay - A powerplay occurs when one team has more players on the ice than the other team as a result of penalties assessed to the shorthanded team. Pylon - A player who is easy to get around due to lack of speed or skill. Rebound - A Rebound occurs when the puck bounces off a goalie, a player, or the net (or occasionally, the back boards) after a shot on goal. Right wing - See Winger. Ripple the twine - Scoring a goal. Saucer pass - A saucer pass is an airborne pass from one player to another. It is called a saucer pass because the puck resembles a flying saucer in mid air. Screened shot - A shot that the goaltender cannot see due to other players obscuring it. Shaft - The long part of the stick that is straight and is held by the player. Shorthanded - A team is said to be shorthanded when they have fewer players on the ice than the opposing team as a result of penalties. Shortside - The side of the goal closest to the shooter. Shot on goal - A shot on goal is a shot that will enter the goal if it is not stopped by the goaltender. A shot on goal must result in either a goal or a save (shots that hit the pipes of the goal are not counted as shots). Sin bin - The penalty box. Slapshot - A slapshot is a hard shot, usually with a big wind up, wherein the player bends his stick on the ice and allows the energy stored in bending the stick to launch the puck forward. Slashing - striking an opponent's arms or lower body with the hockey stick. Usually a penalty is incurred. Slot - the area on the hockey rink directly ahead of the goaltender between the face-off circles on each side. Slow whistle - A slow whistle is when an official waits to blow his whistle, usually due to a delayed offside or delayed penalty call. Snap shot - A snap shot is a like an abbreviated slap shot. The purpose of the snap shot is to combine the main advantages of the wrist shot (shot accuracy and quick delivery) and the slap shot (puck speed). The stick should be at your hip when shotting. Sniper - A player with a powerful, accurate shot skilled at finishing plays. Snipers frequently score more goals than assists. Snipers can be either forwards or defensemen. Spin-o-rama - phrase coined by sportscaster Danny Gallivan to describe a player completing several tight circles with the puck fully under control of his stick, eluding pursuing opponents who cannot keep up or intercept the player. Stack the pads - A save wherein the goaltender drops to one side and makes the save with his leg pads. Stay-at-home Defense man - a defense man who plays very defensively. He doesn't rush the puck very often. Stick checking - Using the stick to interfere with an opponent's stick. Stickhandling - The act of controlling the puck with one's stick, especially while manoeuvering through opponents. Stoned - Made a great save. Sweep checking - Using the stick in a sweeping motion to knock the puck away from an opponent or deter him from passing. Toe drag - Dragging the puck along the ice with the end (toe) of the stick blade on the ice as opposed to the bottom edge. Top shelf - The top section of the net. Video goal judge - An off-ice official who reviews a goal by video instant replay. Winger - A winger is a forward position of a player whose primary zone of play on the ice is along the outer playing area. A right wing is responsible for the right-hand side of the ice and a left wing is responsible for the left-hand side. Wrist shot - A wrist shot is a type of shot that involves using arm muscles (especially those in the wrist and forearm) to propel a puck forward from the open-faced, concave part of the blade of a hockey stick. Zone - One of three zones on the ice, the offensive zone, the neutral zone and the defensive zone.